A 13-year-old boy was referred to our hospital with a diagnosis of acute leukemia. The diagnosis was made elsewhere based on morphology of bone marrow aspirate and was referred for further management. He had pallor and massive hepatosplenomegaly, but no palpable lymph nodes. There was bicytopenia (hemoglobin - 101 g/L, platelet count - 38 × 109/L, and total leukocyte count - 5 × 109/L) with only a few blasts in peripheral blood film [Figure 1]a while bone marrow showed chiefly erythroid cells (~50% of nucleated cells) and blasts [Figure 1]b. Megakaryocytes appeared adequately represented. The morphological impression was acute leukemia. 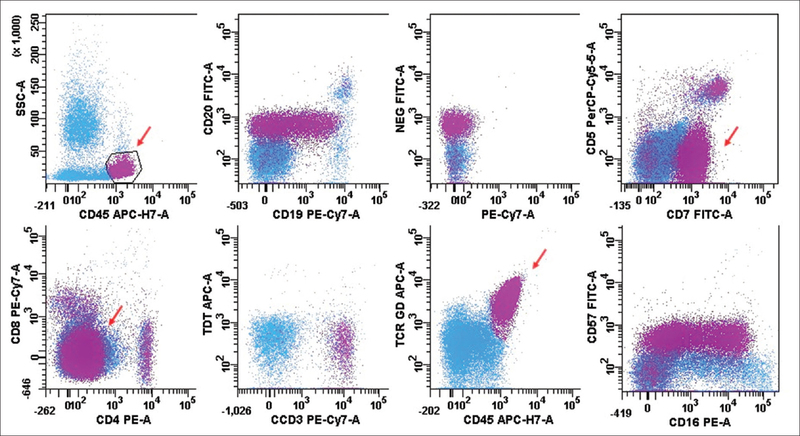 These cells were CD45pos, CD1a neg, CD2pos, surface CD3dim pos, cyto CD3pos, CD4neg, CD5neg, CD7pos, CD8neg, HLA-DR pos, CD16pos, CD56neg, CD57neg, and TCR-γδpos on six-color flow cytometry [Figure 2]. They were negative for immaturity markers, myeloid markers, and B cell markers except for a heterogeneous CD19. The immunophenotype favored a diagnosis of γδ T-cell lymphoma. However, a diagnosis of T-acute lymphoblastic leukemia (T-ALL) could not be completely excluded. Conventional cytogenetics failed to yield metaphases. Trephine biopsy showed an exclusive intrasinusoidal infiltration of tumor cells highlighted by CD3 immunostaining [Figure 1]c and [Figure 1]d, confirming the diagnosis of hepatosplenic γδ T-cell lymphoma (HSTCL). HSTCL is a rare disease, though more commonly seen in young adolescent males. Around 20% of these young patients have a history of immunosuppression in the form of treatment of malignancy (Hodgkin lymphoma or acute myeloid leukemia), use of infliximab in inflammatory bowel disease, or solid organ transplantation. The HSTCL cells are often monomorphic small to medium sized; with blastoid features usually seen at later stages. However, in our patient, the cells were indistinguishable from blasts at the presentation itself. 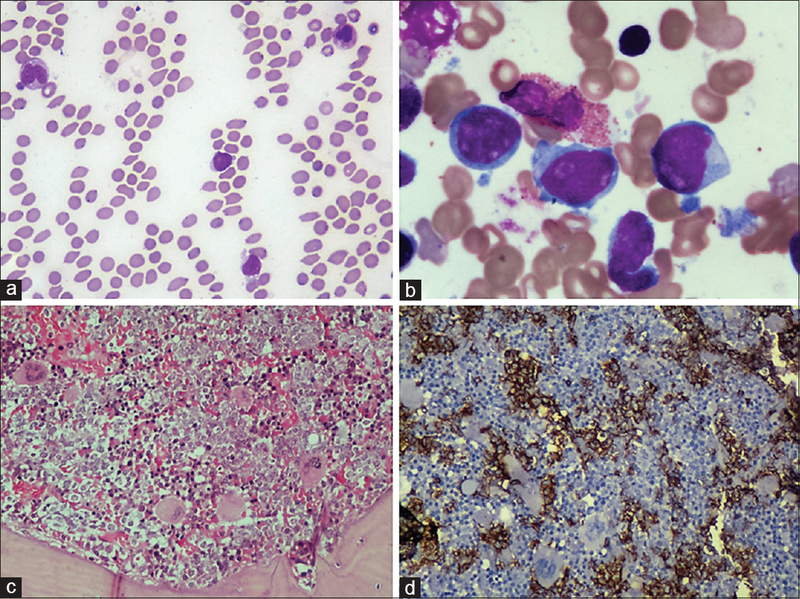 This together with the erythroid hyperplasia led to an initial diagnosis of acute leukemia. This is a potential diagnostic pitfall. The immunophenotype of HSTCL is of inactive cytotoxic T-cells. However, T-ALL can have similar immunophenotype. Immaturity markers (Tdt, CD34) can be negative in T-ALL, while CD3 can be negative or dim in HSTCL,, but CD45 is often brighter in HSTCL. Our case also showed an aberrant expression of CD19 on lymphoma cells, which is reported very rarely. The demonstration of isochromosome 7 on metaphase or extra signals on fluorescence in situ hybridization (FISH) for chromosome 7q will be helpful as they have been reported in nearly 80% of the cases of HSTCL; however are not specific., In our case, cytogenetic examination failed to yield metaphase; and FISH was not available. However, the demonstration of an exclusive sinusoidal pattern of involvement supported a diagnosis of HSTCL over acute leukemia. However, it is to be noted that this pattern is exclusive only in early stages of the disease. To summarize, HSTCL is a rare subgroup of aggressive non-Hodgkin lymphomas (NHLs) with the characteristic sinusoidal involvement of liver, spleen, and bone marrow. They have a poor prognosis and require different management strategy necessitating an accurate diagnosis. It can be easily misdiagnosed as acute leukemia on morphology as well as flow-cytometry, though massive hepatosplenomegaly with bicytopenia and no lymphadenopathy is highly suspicious of a diagnosis of HSTCL, especially in young individuals. Clinicians, hematologists, oncologists, and pathologists need to be aware of this rare and aggressive form of NHL so that an early diagnosis can be rendered and the patient managed aggressively. Visnyei K, Grossbard ML, Shapira I. Hepatosplenic γδ T-cell lymphoma: An overview. Clin Lymphoma Myeloma Leuk 2013;13:360-9. Pizzi M, Covey S, Mathew S, Liu YC, Ruan J, Leonard JP, et al. Hepatosplenic T-cell lymphoma mimicking acute myeloid leukemia. Clin Lymphoma Myeloma Leuk 2016;16:e47-50. Shi Y, Wang E. Hepatosplenic T-cell lymphoma: A clinicopathologic review with an emphasis on diagnostic differentiation from other T-cell/natural killer-cell neoplasms. Arch Pathol Lab Med 2015;139:1173-80. Kapur LH, Khaled Y, Solh M, Ward D, Chang CC. De novo CD3 negative hepatosplenic T-cell lymphoma: Diagnostic challenges and pitfalls. Arch Pathol Lab Med 2014;138:969-73. Patkar N, Nair S, Alex AA, Parihar M, Manipadam MT, Arora N. Clinicopathological features of hepatosplenic T cell lymphoma: A single centre experience from India. Leuk Lymphoma 2012;53:609-15.